AV Events has specialised in corporate functions from its inception. We offer professional, high quality equipment and crew to support your events, from CPD conferences to product launches or drinks receptions. 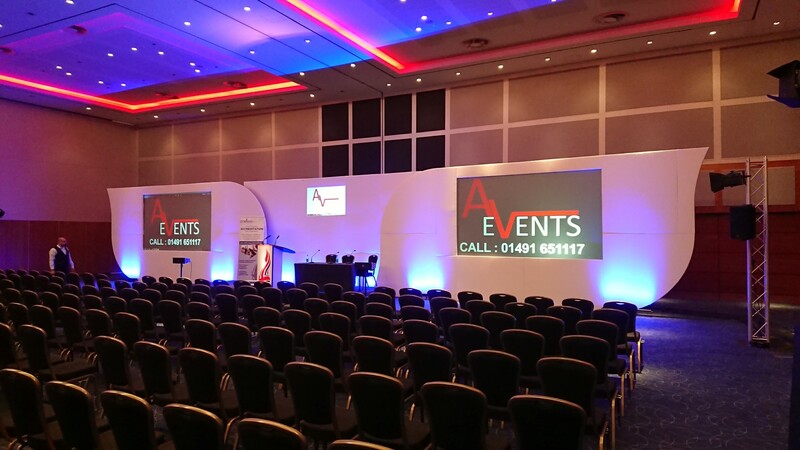 Having provided event support across Europe and even further afield, as well as in-house meetings in the Thames Valley, we would be very happy to offer advice or support to your event, whatever and wherever it is. All our activites are fully insured including PLI, and we are able to provide corporate references on request. Brilliant, all worked and thanks! 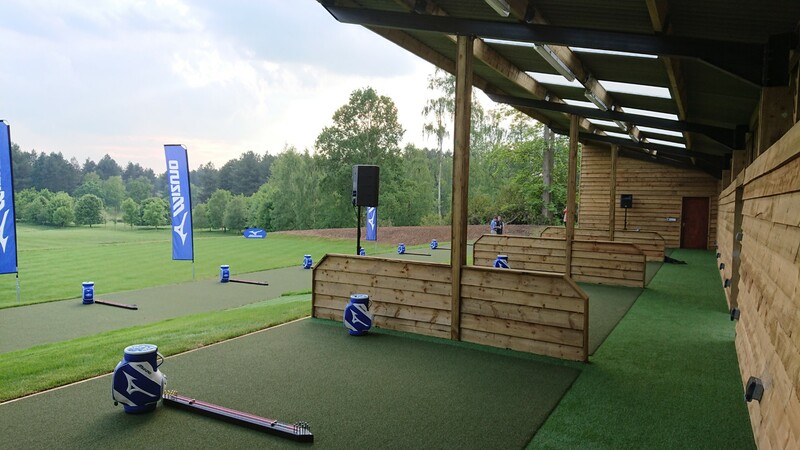 Introduced by four world class golfers, who broke the range in with the first drive, along with taking questions from the audience, the golf course hosted their opening ceremony to great fanfare. AV Events was recently very happy to provide technical support for a four day event at the O2 in London. Comprising a main plenary set for 400 delgates, AV Events also provided power to 131 exhibition stands, ran six breakout sessions, and supported dinner speeches and more. We made use of our laser projectors to generate and provide crystal clear slides with high brightness and contrast. Used in conjunction with our SDI sender units, the proejction was setup in minutes. Our microcue remote presenter system, gaming-level laptops and pcs, repeater monitors and a high definition matrix switcher completed the AV setup in the main room. 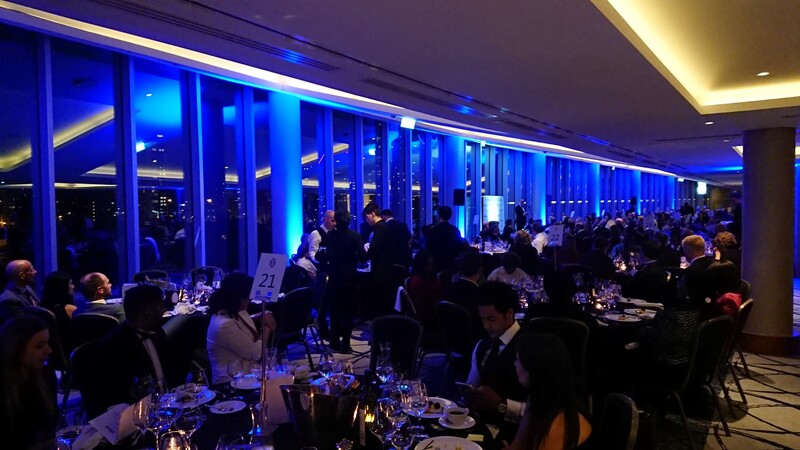 One of the evening events at this event made use of our battery powered PA speakers, and battery LED uplighters, to provide a no cable, no mess setup for dinner overlooking the Thames. In December we supported a joint end-of-year wrap up conference, which translated into a Christmas dinner for the evening. Amazing, thanks so much for everything! A local but internationally trading company held an end of year internal meeting for roughly 100 employees, discussing internal projects and targets. 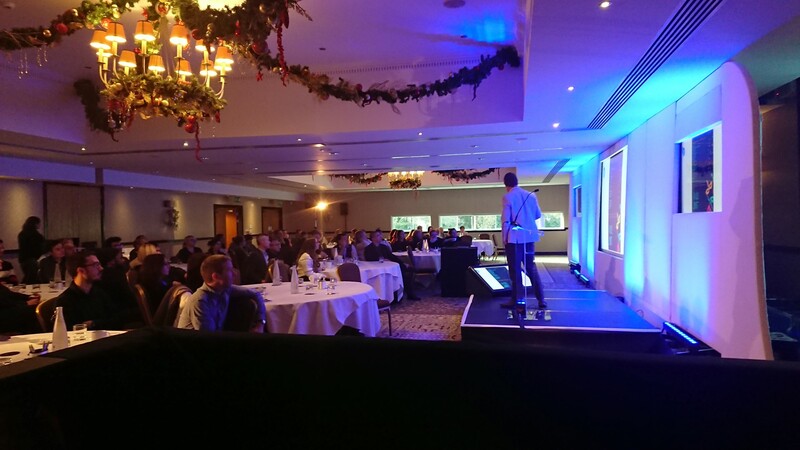 Using the full width of the room, we provided a white set with three built in screens as well as a small stage, perspex lectern and PA system. After the formal meeting, the room was re-used for the company awards nights. Changing the set uplighting is a simple and effective way of altering the feel of a room without additional costs. 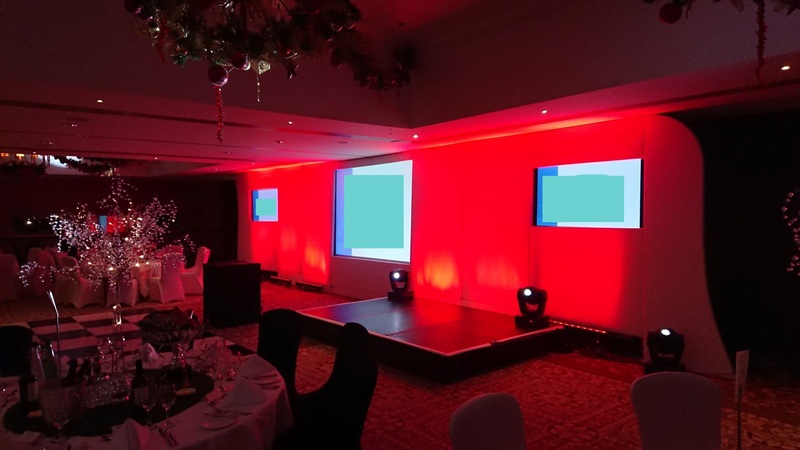 For the awards we provided a custom powerpoint, audio sting playback, and moving head lights to help the company celebrate their best achievers of the year. In March we attended a three day conference with an annual dinner. As always, thanks again lads. See you next year! 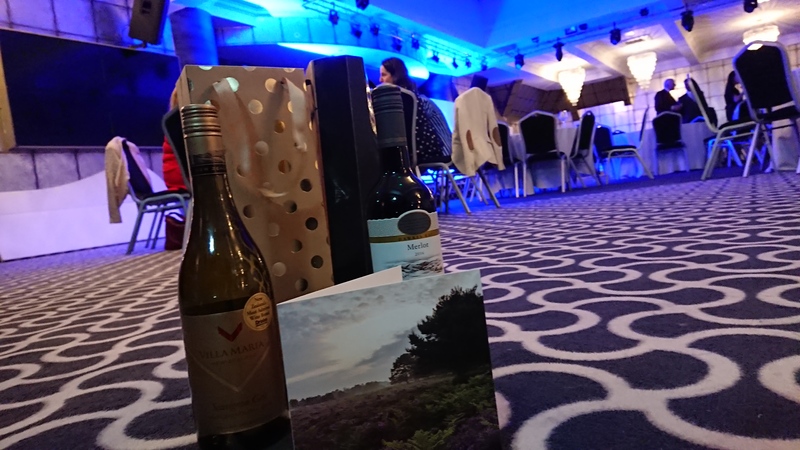 Members organisations have to walk a line between professional training and member social benefits, which we were happy to support via a conference plenary and four breakout sessions, along with lighting for a drinks reception and dinners. The main room content was confidential, however as seen above, as set for dinner, content was provided via two video walls and a central screen. 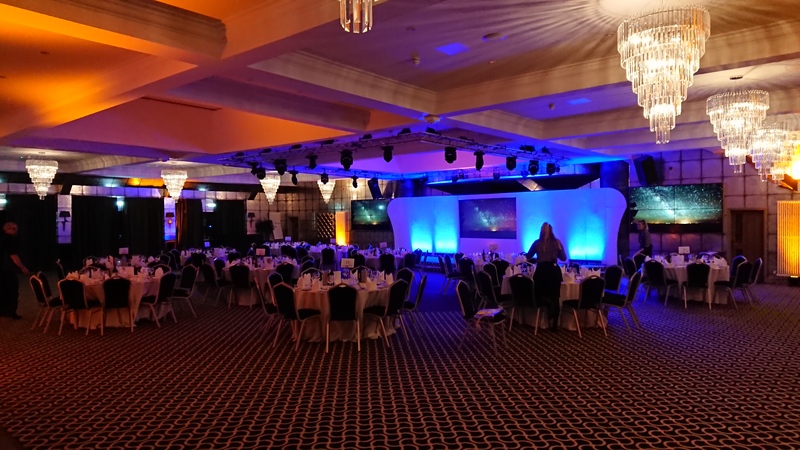 For the end of conference annual dinner, the room was transformed, as with our previous example,with uplighting, highlighting, and a projected starscape. Use of the in-house lighting rig was made available.